So in case you didn’t know already, I LOVE to SHOP! 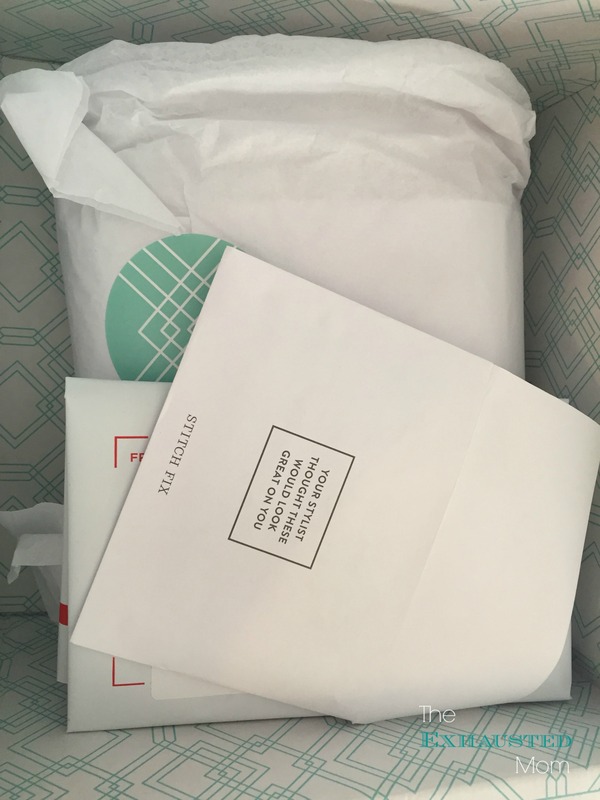 I recently shared of my complete LOVE AFFAIR with Stitch Fix…I couldn’t keep it in anymore. So here I am on Fix #9 and I just keep falling further and further down the rabbit hole. I’m actually thinking of ways to budget our grocery bill so that I can keep getting my monthly fix….it’s just that serious. Ok. So I’m kind of cheating by putting 3 pieces together in one look, but I really love them all together! Halter necklines are my favorite because they make my shoulders look smaller than they probably are in real life. This one is cute because it has a nice fun detail around the neck. I totally kept this top because it’s cute with jeans, shorts, a skirt…. First off, yellow is my all time favorite color! Living in Miami, shorts are a MUST have since it’s hot here all year round. I don’t normally pay this much for shorts, but these are thicker material and I can make them casual or wear them with wedges for a dressier look. Not to mention they look good on my big ol’ booty. I kept them. My boys ask me all the time: “Why do you have so many purses?” I just shake my head and think to myself, “they just don’t understand.” A purse isn’t just for utility purses. They are part of fashion too! That’s why this coral little number was a keeper! This is my new favorite go-to dress for all occasions! It’s a linen material so it’s nice and light. The fun embroidered pattern goes really well with my favorite Steve Madden shoes (not from a Fix). This is a perfect item to have when I’m tired of wearing shorts and it’s too darn hot for jeans! Ok, so I’ll be honest. I wasn’t completely sold on this dress when I first took it out of my Fix. It’s just not something that I normally would wear. Then I remembered that was the main reason I started getting Stitch Fix…to get me out of my fashion box (total pun intended!). So I tried it on and was pleasantly surprised that I loved it instantly! The flared sleeves didn’t make my arms appear bigger and the stretchy jersey material gave in all the right places. I can’t wait to wear this one (and doesn’t it look great with the Street Level Clutch?). The prices seem a bit scary for each individual piece, right? That’s why I don’t look at the prices when I try them on. I want to make a real decision without being swayed by the price tag. 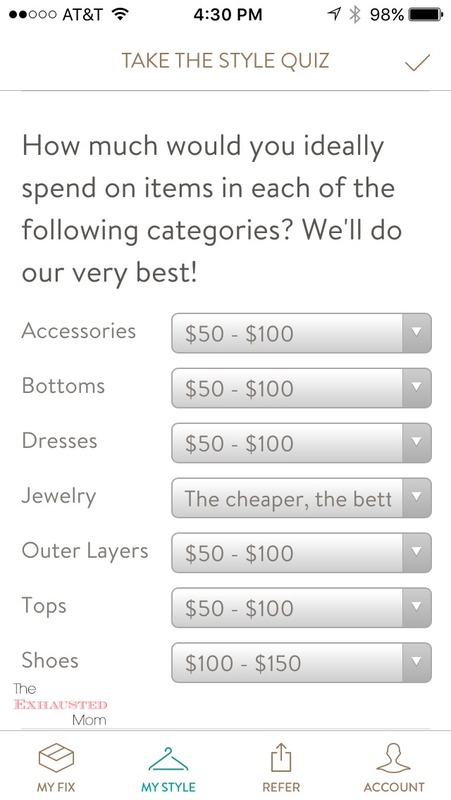 The best part is, if I kept all 5 items in this Fix, I got $85 off plus my styling fee credit of $20. So for all the items, I paid $235. I would spend that much if I walked into the Gap and got some jeans, a t-shirt and a pair of shorts. So to me, it’s worth it because I got items that I wouldn’t normally pick out. Do you have any questions? You know I’m always happy to help! Check out some other Fixes that I’ve received! These may be the box that most fits my style of any that I’ve seen to date! I love everything you showed here! I got that last dress as well this summer and it is one of my favorites of all time. So flattering and comfortable! I love what your stylist pulled together and had to laugh that you’re thinking of reworking your grocery budget to fund your Fixes! 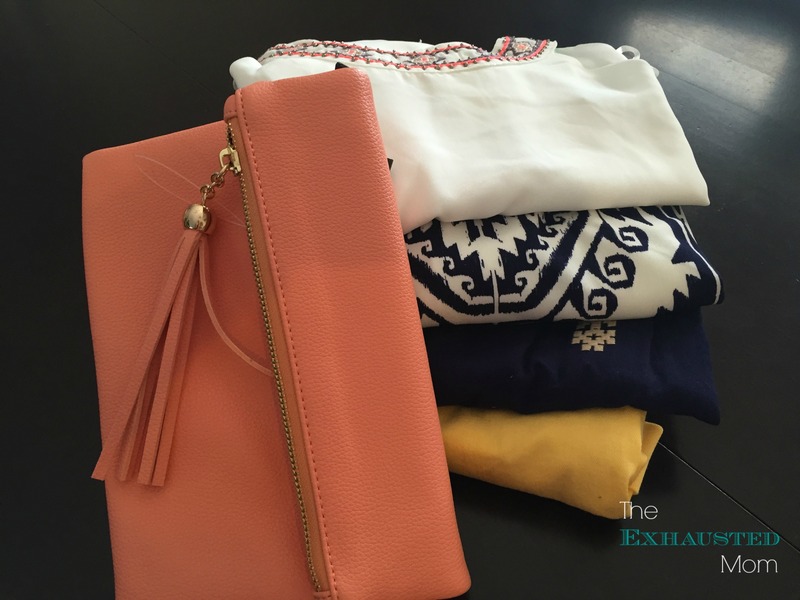 And yes, boys never understand the need for more purses (or shoes) but I love the way that coral clutch matched so well with the things you got this month AND? It totally screams summer! Perfection! 🙂 . I really was hesitant to jump on this bandwagon, but I am loving it! 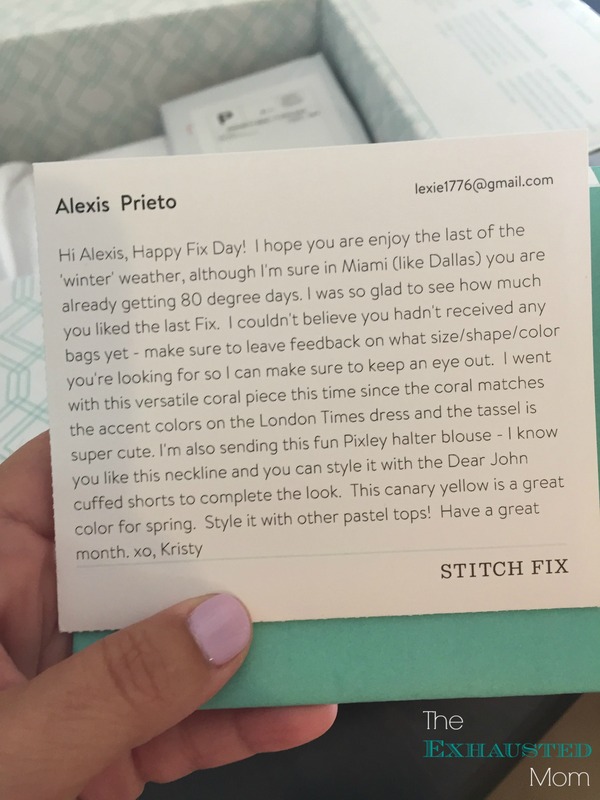 I have to say… I have a lot of friends who do Stitch Fix and their style is much more pretty than mine, and I haven’t really ever thought of joining. However, I pretty much love everything you got, and I love how many Boho chic pieces they sent!! The stylists take a couple months to really get to know you. And my stylist really uses my Pinterest board to guide where my head is each month. You should really try it! Wow I really love everything you got in your box!! I love this because I actually do not like shopping for myself and I welcome all suggestions. I am totally crushing over the styles and selections. I love your pics! 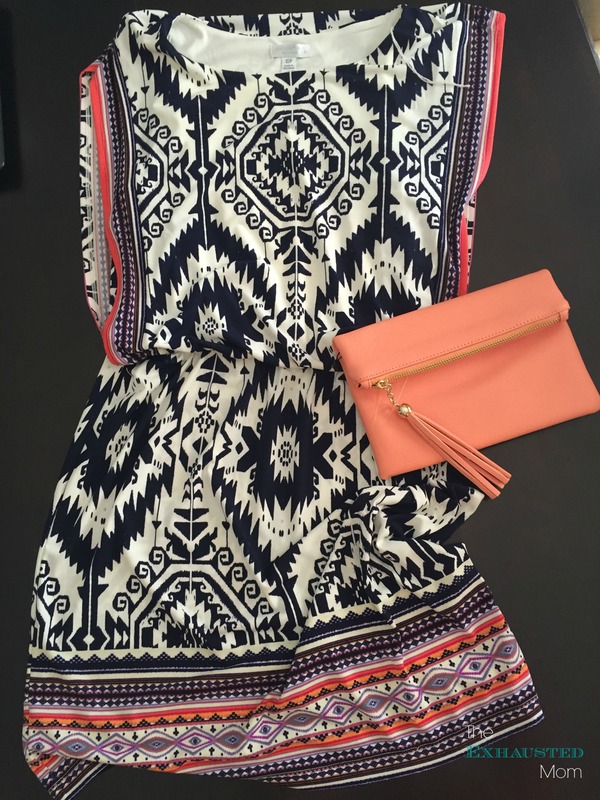 Would never think that a peach clutch would look so good with that print. Now ow do I move my budget around to afford my fixes!! Ha! I have to put like $20 a week away so I can have enough…and I guess I could move a Fix to another month, but maybe not! I just ran across your post on Pinterest and the London Times Bobby Jersey dress caught my eye. I have the exact same dress…only I got it at the Dress Barn and it was around $50! I was so surprised to see it in a Stitch Fix post. I do love the dress!! It’s so flattering! I would love to know what your style description says about yourself because these are great! Renee, I simply am truthful about my size and body shape. Then I pin a bunch of things I like on Pinterest. My stylist looks at that and picks out items that are similar or sometimes exact. Also, in my monthly note to her, I tell her “I’m looking for t-shirts.” or “I need jeans.” or even sometimes I write “Surprise me.” The more you have on Pinterest, the better. She can really get a feel for what you like.